Okay, I have my main idea for doing the stairs, and I have a secondary idea that I think may be a better approach, but will require very careful planning. I also am going to do a ladder for those that don't want to go to the bother of the stairs. Today may be a struggle, though. I thought the driver door of my car was frozen yesterday and was trying to yank it free, to end up slipping on the ice and ending up falling on my bum, with continuing momentum carrying the back of my head to the cement driveway. You know the phrase 'I saw stars'? I did. It was a struggle last night and the struggle continues today. Spent way too much time figuring out what I would throw the new stairs onto, but realized I could do the ladder version. Decided not to do a second one of these, but hadn't done mproteau's Tudor Hut from Papercuts, so threw the ladder and stairs onto it. Also, I like the wagon! Well, when I hit my head, I was wearing my wool Irish walking cap, and the band cushioned the hit. I'm a bit familiar with concussions. I had one back in 2001 that I still have an occasional issue with. Post-Concussal Hypotension. Every so often my blood pressure drops out from under me. I keep a gallon of water in my fridge. I fill my two two-liter pitchers each morning and drink from them all day. Staying hydrated helps prevent blood pressure drops, and this gives me a good way to keep track of how much water I am drinking. Other than my neck hurting, I think I am doing well at this point, but I am trying to be careful. At this point, I am rather pleased with the coach. Not the design from the illustration, but how well the coach in the illustration is represented in the model. Last night I temporarily placed the ladder and took a photo. Then I removed it and started installing the stairs. In test-fitting, the inner and outer stair walls fit very nicely. I did it this way since most don't seem to like to do mirror prints on the back of parts, but if I were wanting to do this other than just as an exercise, I would print this as a single part, printed on both sides. Less issues with lining up parts and getting the edging done well. Your sixth picture looks just like the illustration. I would say you nailed it. A++! Thank you, sir. When I started this, I'd planned on moving on to doing a more typical omnibus. I also thought it would be a good exercise to do a few circus wagons for next month. I really like the new hitch arrangement on this and plan on carrying it over for the circus wagons. A simple appropriate hitch was one of the main things I wanted to accomplish. The other goal was to do a decent set of steps. 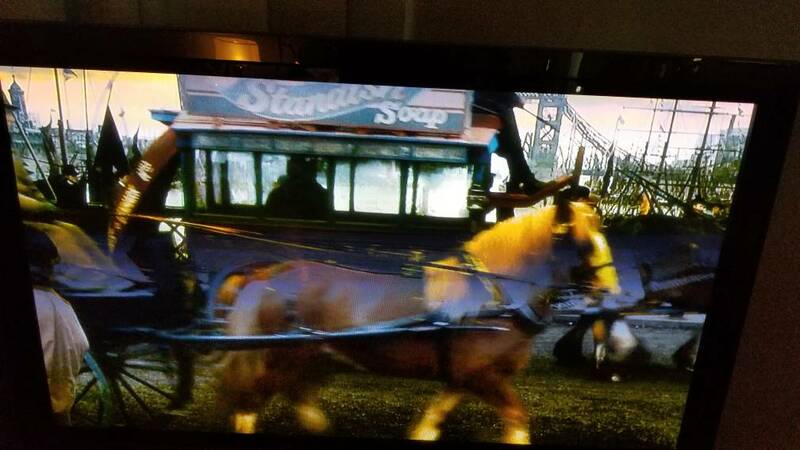 As a side, circus wagons typically had ladders, so the ladder was another benefit. Funny how it came back to me needing to develop the stairs myself, and the winning ticket on that was what I envisioned early on. 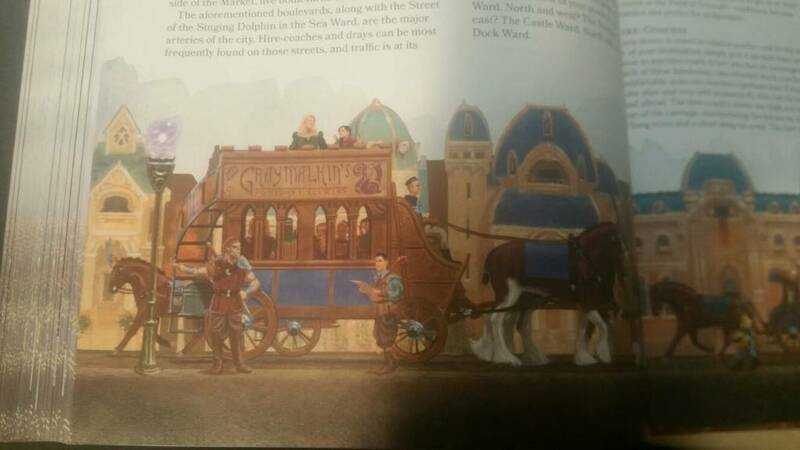 Are Waterdeep and Dragon Heist part of the DnD collection? Waterdeep is a city in Forgotten Realms. The realms have been around for decades. I am not sure when Waterdeep was first detailed. Dragon Heist is a popular new module set in the city. Or so I gather. Yeah, its kind of a two part adventure, the first one, set in waterdeep involves breaking into a dragons hoarde amidst 4 seperate crome lords, and is called dragon heist. the second is called dungeon of the mad mage which is a huge mega dungeon, and the setting from the first book provides background and a setting for players to interact with between dungeon expeditions. I did, and linked the person to this thread. They were quite grateful! 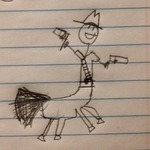 I am that person cowboycentaur mentioned. Thank you so much Vermin King! I can't wait to build this and ram it into the front door of the Yawning Portal. Glad you could drop by. Do you build much out of card? Vermin King I don't believe I've mentioned this before, but I definitely should have. For a guy who isn't an "official/professional papercraft designer", you do damn fine work. i was never born, i just am, and i've been dead for years. Thank you, sir. Keep in mind, when I pick a project, it is usually after I think it through a little bit and think I know a way to accomplish it. Like I thought the Doctor Who Edsel would have been fairly straight forward, only then I noticed the blasted tail lights and the rounded rear fin. I thought I had it worked out twice now, and even tried a version ignoring the 3d aspect. None of these has worked. On this one, the only difficult part of the design (other than figuring out that driver box that didn't make sense) was the spiral stairs. I had an idea on making it work, then I tried to take the stairs from three different buses to adjust them to work. Did not work, but with the experience of working with them, I was able to go back to my original concept, and turn it into a design. 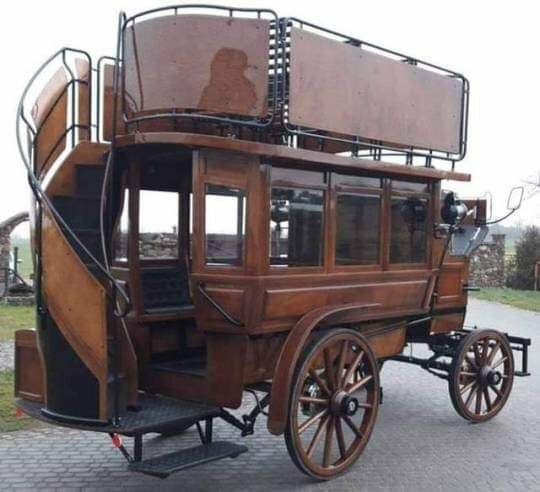 It also helps that the Victorian Koachwerks (VK's) Coach, Wagon and Cart collection has gotten to be rather expansive. I have developed some experience in that realm. It's hard to tell what is going to interest me, though, and whether it will make it to completion. Saw this photo on facebook and just thougut it was neat! I dont know, there was just the one image. 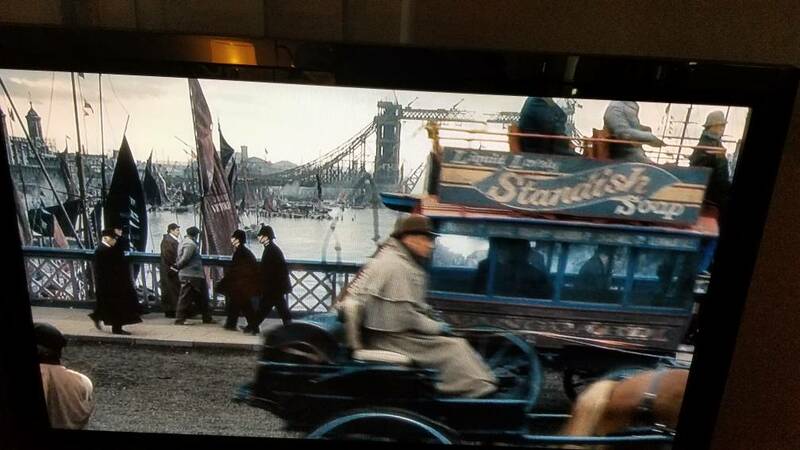 Was watching the robert downey jr sherlock holmes movie and saw a double decker!